Michigan has its man. The prodigal son of Michigan Wolverine football has returned to Ann Arbor and the excitement for the future of the program is building rapidly. Jim Harbaugh may very well return Michigan to greatness and the love affair between the alumni and Harbaugh is just getting started. However, I find myself puzzled by the entirety of the Harbaugh to Michigan situation. 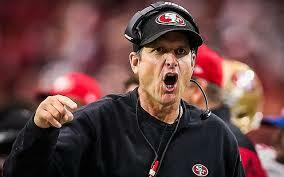 Jim Harbaugh was the head coach for the San Francisco 49ers, arguably the greatest NFL franchise ever. The 49ers had made it to three consecutive NFC championship games and to one Super Bowl, which they lost to the Baltimore Ravens. To make matters worse, Harbaugh’s brother, John, coaches the Ravens. Jim Harbaugh was within reach of the apex of American sports. The Super Bowl and the Lombardi Trophy represent the pinnacle of the sport of football. The NFL is undoubtedly the most popular league in America. The ratings and revenue speak for themselves. College football, meanwhile, has risen in popularity from being a sport that garnered significant ratings regionally into a more nationally popular product. The reasons for this rise begin with its link with the NFL and in America in 2015 being linked to the NFL will allow virtually any product or sport to rise in popularity. The next reason is that the widespread interest in sports gambling has made its way to college football. In America, people love to bet and they especially love to bet on football. Finally, this year the college football playoff debuted and the results are astounding in terms of viewership and revenue. Still, the NFL is king and the question as to why would Harbaugh leave and come back to college is a reasonable one. I will not to pretend to know the relationship between Harbaugh and his alma mater. It is safe to assume that there is certainly an emotional connection he feels to Michigan. I do, however, have a pretty clear understanding that the 49ers are not losing sleep over Harbaugh leaving. The front office and the players in San Francisco were tired of Harbaugh and his demeanor. Often college football loyalists will cite a major positive of coaching the college game is avoiding players that are difficult to coach. First, let me point out that there are difficult players to coach in the NFL and in college football. It would be naïve to believe otherwise. Players like Terrell Owens often fell out of favor with teammates and the front office due to their difficulty to work with and their demeanor. Jim Harbaugh is like the player that is difficult to coach. He is quite successful and is someone who makes a positive impact on what happens on the field. However, off the field his personality wears down his roster and the front office. Ultimately, he was deemed to be not worth the trouble by the 49ers management team. Is it possible that word had been passed around the NFL that he was insufferable to work for and be around? Is that why he did not receive an interview with the Raiders or the Bears? Both organizations would seemingly have been willing to give Harbaugh the same control that Chip Kelly has in Philadelphia. Furthermore, if you think that he might have had an interview “behind closed doors” that nobody else knew about and that no NFL insider could have ever found out about, then you might want to rethink that theory. Adam Schefter has sources that inform him what the Raiders starting offensive line ate for breakfast today, complete with a list of all possible allergies and complete medical records. He would know if there was an interview. Is it so unreasonable to speculate that Harbaugh had worn out his welcome in most NFL circles and that he did not receive any other offers? Lest we forget the heated altercation between Jim Harbaugh and (then) Lions coach Jim Schwartz. These are not the only antics that turn people off from Jim Harbaugh. Yes, that is correct, he smeared a player’s blood on his face like it was war paint. I think it is reasonable to discern that Harbaugh has at least worn out his welcome in most NFL organizations for the time being. He is a great fit for the college game and I would expect him to enjoy a lot of success at Michigan. I do, however, believe that Harbaugh will eventually return to the NFL. A man that is so driven and came so close to winning the Super Bowl probably still thinks about what it would have been like to hoist the Lombardi Trophy (and then give his older brother a shoulder bump at midfield for good measure).